Simple and classic. 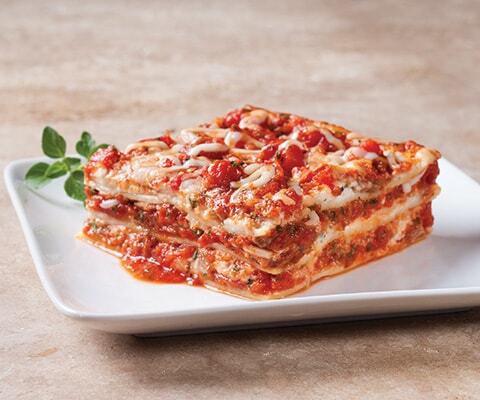 This lasagna is a traditional favorite at every family gathering. Preheat oven 350°F. Cook pasta al dente according to package instructions. Drain and set aside. In a medium bowl, mix together Ricotta cheese, Parmesan cheese, eggs and 1 cup of Mozzarella cheese, and set aside. Meanwhile, in a large skillet over medium high heat, brown sausage for 4 to 6 minutes, or until cooked through, stirring until small crumbles form. Spread 1 cup of pasta sauce evenly over the bottom of a 13x9 baking dish. Layer with 1/2 of cooked lasagna noodles, 1/2 of Ricotta cheese mixture, 1/2 of cooked sausage, 1/2 of remaining pasta sauce and 1/2 of remaining Mozzarella cheese. Repeat layers. Bake uncovered for about 40 minutes, or until hot and bubbly. Allow to rest for 5 to 10 minutes before serving. If desired, substitute Classico® Florentine Spinach & Cheese Pasta Sauce with Classico Fire Roasted Tomato & Garlic Pasta Sauce. I agree with the other reviewers that the amounts called out in the recipe are confusing. With a 24 ounce bottle of sauce, this equals 1 cup of sauce for the bottom, 1 cup for the middle layer and 1 cup for the top. Using the 1/2 method is confusing...only when I had it all put together, was it obivious 1/2 meant 1/2 of the REMAINING sauce. This recipe would benefit from 1/2 as much more sauce or 12 more ounces, as the end result were dry. Yummy! Saved me lots of time, and it was a hit at a dinner party! The 15 is fifteen ounces of ricotta cheese.